Pesto is super easy because it doesn’t involve cooking. Whip this up while the pasta is on the stove for a quick and easy meal. In a small pan, toast pine nuts on medium high for about a minute or until they are golden brown. 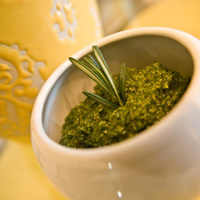 Combine fresh basil, pine nuts, oregano, lemon juice, and garlic in a food processor until well pureed. Slowly add 1 Tbs of olive oil at a time, blending each round until all ingredients are combined and mixture is smooth.